A sloped landscape can present serious construction challenges. If your Laguna Beach, CA, backyard project features a severe grade, you may think your design options are limited, but D.L. Hickman & Son Inc. can help you create beautiful softscapes and hardscapes, even when working with a sloped yard. Consider some of the following tips for creating beautiful landscapes for homes with sloped backyards. A retaining wall will give structure to a sloped landscape while helping to control soil erosion and water run-off. A retaining will also increase a home’s value by converting an unusable area into a functional space. For such a permanent and hardworking landscaping element, retaining walls offer excellent design flexibility. The look and design of retaining walls are easily adapted to match any landscape style. Dry stacked stone masonry walls will complement a natural backyard. A manufactured wall system is easier to build and provides a more modern look. Brick retaining walls will complement a formal landscape. To match new retaining walls to existing hardscaping features, stone veneer is available in almost any style. Plants and greenery can be added to soften the look of retaining walls and help them blend with the landscape. A sloped backyard is the perfect starting point for a beautiful water feature. Take advantage of a natural slope by incorporating a waterfall into the landscape design. A waterfall provides a picturesque focal point and adds movement and the soothing sounds of running water to a landscape. Waterfall designs are easily adaptable to any size landscape. Consider a pondless waterfall for a small yard. A meandering stream works well in a large landscape with a mild slope. For a complete backyard oasis, consider the combination of a waterfall and stream with a pond. The larger the landscape, the more drops a waterfall can feature. Terraces will completely transform a sloped backyard into usable space. With a good landscape plan, terraces can help create zones in a large landscape. Each level of the yard can feature a different outdoor living space. Consider the use of each area when planning the layout and traffic flow from “room to room”. Situating the outdoor kitchen and dining room close to the house will add convenience. View lines can also help determine the ideal layout. Including a pool on a lower level will allow it to be viewed from above. Sitting areas on an upper level will offer expansive views over a large slope. Stairs serve multiple purposes when it comes to landscape construction and sloped backyards. They add form and structure to the landscape and provide easy navigation over a steep grade. Stairs can connect different levels of a landscape or provide access to otherwise unreachable areas. The design of the staircase will vary depending on the size of the yard and angle of the slope. Curved stairways help reduce the severity of the slope and provide a meandering path. To make stairs feel like a part of the landscape, incorporate them as part of a hillside garden. Natural stone steps will blend with an informal rock garden, while wide, concrete steps can be used to complement a modern landscape. 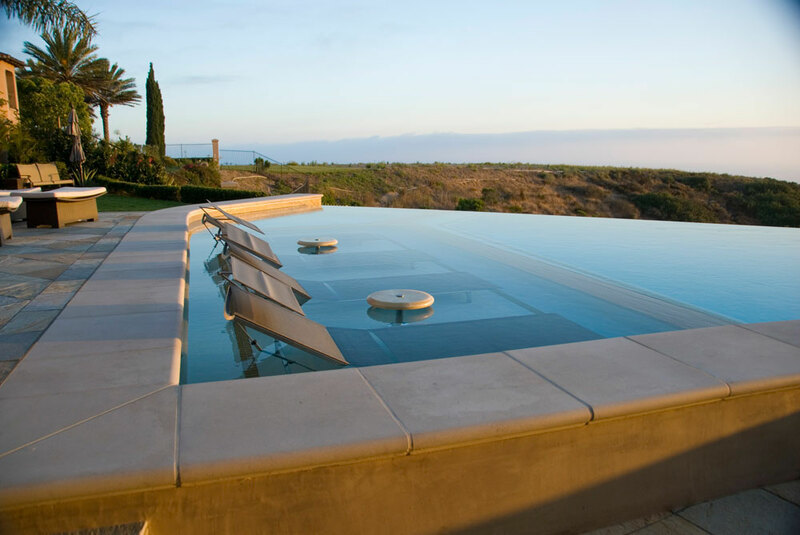 To make a huge impact with a sloped landscape, add an infinity edge pool. A natural drop-off in the landscape provides a dramatic backdrop for a gorgeous infinity pool and creates stunning views. Since a pool requires excavation and grading anyway, a design professional can turn a sloped landscape into the perfect setting for a beautiful pool.